Happy Earth Day everyone! One of my favorite ways to be eco-conscious is to use something that's already around or re-use it. I love finding vintage fabrics at yard sales or Goodwill. This fabric came from an amazing estate sale I went to last year where I scored TONS of vintage fabric on the super cheap. My grandmother just re-did her kitchen, so I decided to make her some potholders from some of that fabric. Boy do I love me some orange! 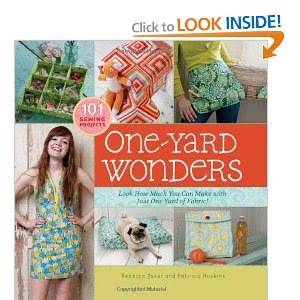 I used the pattern from One Yard Wonders by Rebecca Yaker and Patricia Haskins. It's the first project I've done out of this book, and I was pleased that the directions were good, and the writing complete and straightforward. I'm looking forward to making more from this book! What are you doing for Earth Day?? Remember, Love Your Mother! !